Can’t Skip Tracks: Every single one, seriously. I held off listening to this one for about a week after I finally got it. I was scared. I didn’t want GKMC to underwhelm me like J.Cole’s Sideline Story did. It’s hard to have a great major label debut, but for some reason we seem to forget about those that don’t have one. When I started listening, those fears were gone by the 4th song. The album starts with prayers murmuring “Lord God, I come to you a sinner,” as if the whole album is Kendrick talking to a higher power. He subtitled the record “A Short Film by Kendrick Lamar,” perfect for what comes at on GKMC. We follow the rappers life, from breaking into a house “in search of any Nintendo,” his first experience with marijuana, his stories showing the by any means necessary mentality (“Go at a reverend for the revenue”), his first love, and much much more. The opening lines of each song are consistently filled with fire, with the closing ones leading to the beginning of the next. The album flows from start to finish, filled with thematic strengths and stylistic excellence. There’s so much to say about this album; it’s the first one that will go down as a “classic” in years. Dre officially passes the torch to Kendrick on “Compton,” which sees Lamar run circles around the former West Coast king. The West Coast is now Kendrick’s, if not the whole world. 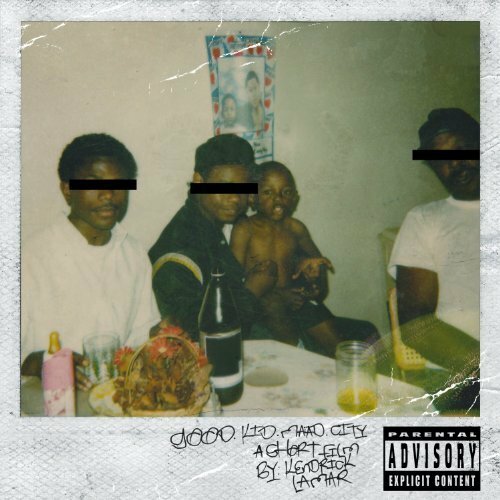 The “movie” part of the album closes with a voicemail from Kendrick’s mother, “If I don’t hear from you by tomorrow, I hope you come back and learn from your mistakes. Come back a man… Tell your story to these black and brown kids in Compton… When you do make it, give back with your words of encouragement. And that’s the best way to give back to your city. And I love you, Kendrick.” A true work of art.